Unlike the PlayBook OS, which did a decent job at aping webOS's multitasking cards user interface, BlackBerry 10 instead lays out currently running apps in a two-by-four grid, allowing you to have up to eight apps running at once. Yeah, eight. Open a ninth and the last app drops off and you'll have to reopen it if you really want it. While that's frustrating, it's even more disappointing given that BlackBerry 10 allows these minimized app cards - err, sorry, they call them "frames" - to display secondary information instead of just a small preview (e.g. a weather app can show the current conditions). So if you want to keep the weather app there as a widget of sorts, be sure to open it up every eighth app. To complicate matters further, dragging the multitasking grid to the right will reveal the "BlackBerry Hub" everything-goes-here messaging system, while swiping to the left goes to a traditional grid-of-icons app launcher. Much of the operating system is dependent on gestures. Turning on the devices is accomplished by swiping up from the bottom of the screen; dragging all the way up will turn on and unlock. There's no home button or gesture area, so dropping out of a running app happens with a swipe up from the bottom, and if you continue that drag to the right you can pull whatever's on the screen to the right and take a peek at the Hub. Convenient? Sure. But so is a notification drawer or dashboard, and that gives you an idea of what's going on (boom, icon at the bottom of the screen) instead of having to perform a deliberate gesture to see what that little red light is about. 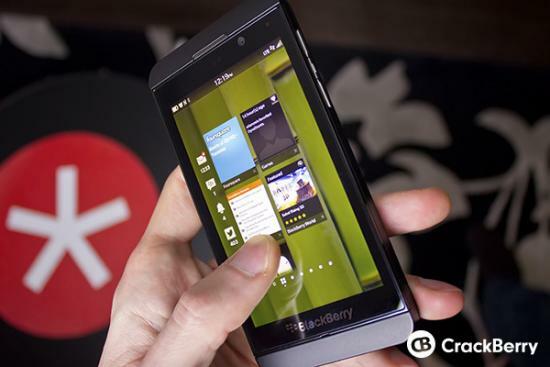 Overall, BlackBerry 10 looks like a nice OS, and the Z10 and Q10 look like fine phones. With the exception of a few misses over the years (looking at you, BlackBerry Storm), hardware has always been where BlackBerry smartphones have excelled. Even the limited production run of the Dev Alpha devices felt great and solidly built. BlackBerry 10 has plenty of unique ideas, but like Ubuntu for Phones it might be missing hard on the discoverability side of the equation. Luckily for BlackBerry they have a loyal and still relatively large customer base and long-standing excellent relationships with carriers worldwide. In fact, all four major US carriers have already committed to carrying the Z10, and a few have even spoken up about carrying the Q10 when it's eventually available. Too little too late, or enough to save BlackBerry from the dustbin of technological history? Well, that's up to you the potential customer to decide. For our part we're still holding out for an Open webOS smartphone, whether that comes form a manufacturer or homebrew porting efforts. In related news: Alicia Keys has been named as BlackBerry's new Global Creative Director. That was a surprise.